Mizoram CM, Zoramthanga has already stated that the people of Mizoram are opposed to the Citizenship (Amendment) Bill. 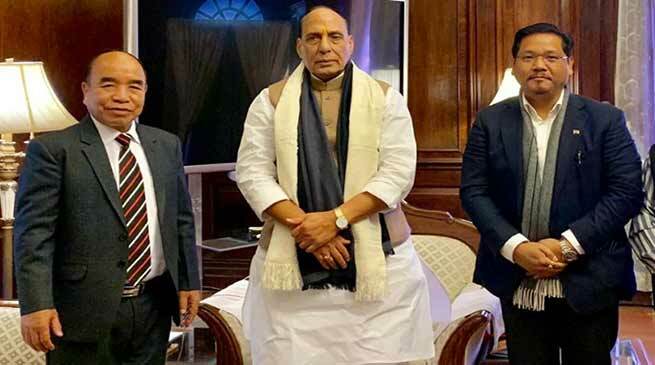 Mizoram Chief Minister Zoramthanga and Meghalaya chief minister, Conrad K Sangma on Friday met the Union Home Minister, Rajnath Singh to apprise the latter of the opposition registered in their states against the Citizenship ( Amendment ) Bill. According to Sources , Home Minister Rajnath Singh assured them that ” he would meet all the chief ministers of the Northeastern states to discuss the issue over the Citizenship (Amendment) Bill 2016. The Home Minister is likely to convey through the NE chief ministers that rights of the indigenous communities in the region would be protected under any circumstances. Held meeting with Union Home Minister Sh. @rajnathsingh ji to express concern against the Citizenship Amendment Bill along with MDA partners. We have opposed the bill and have urged centre to reconsider. Mizoram chief minister, Zoramthanga has already stated that the people of Mizoram are opposed to the Citizenship (Amendment) Bill. Assam Chief Minister Sarbananda Sonowal and Manipur chief minister N Biren Singh have already met Rajnath Singh earlier this week over the Citizenship Bill as the protest was raging in both the states against it. Manipur chief minister has reportedly requested the Union government to keep Manipur out of the purview of the Bill.